Hello, dear readers! The biggest gaming show in North America just wound down and I have returned a bit ragged but still raving about the experience. 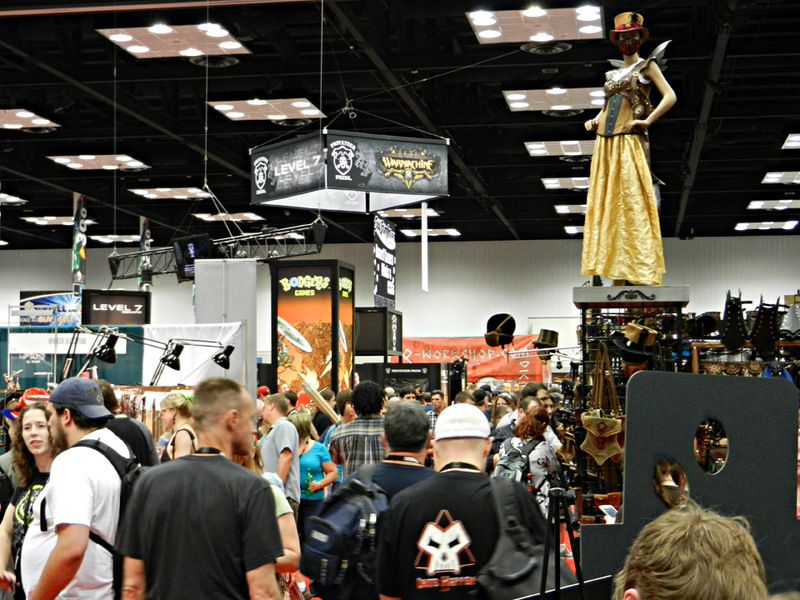 GenCon 2012 was a massive celebration of geekdom and gaming, and the sheer spectacle of it all never disappointed. 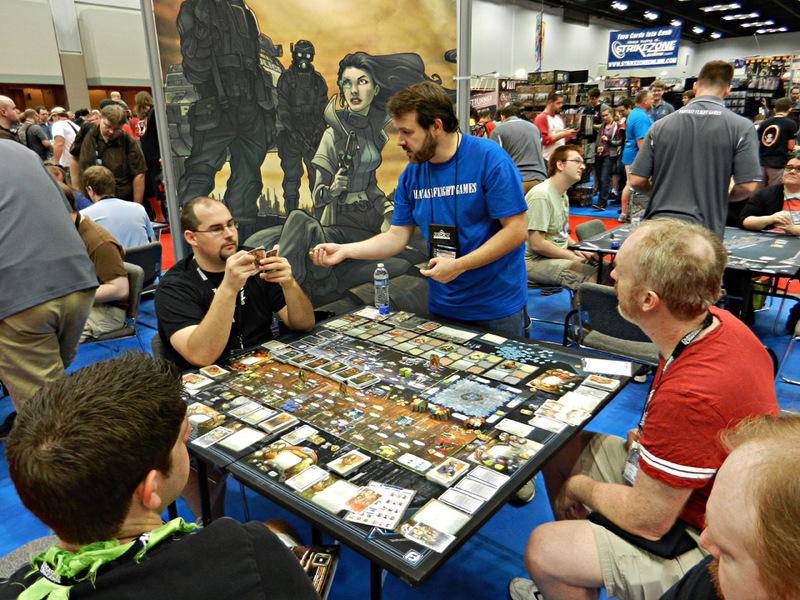 The best part about GenCon for me was the chance to meet up with a lot of old friends and make some new ones meeting fans, supporters and colleagues over the four eventful days. There’s never enough time to do and see everything on your list at these things, but I left feeling satisfied that I had done and seen more than enough to fill me with great memories for years to come. 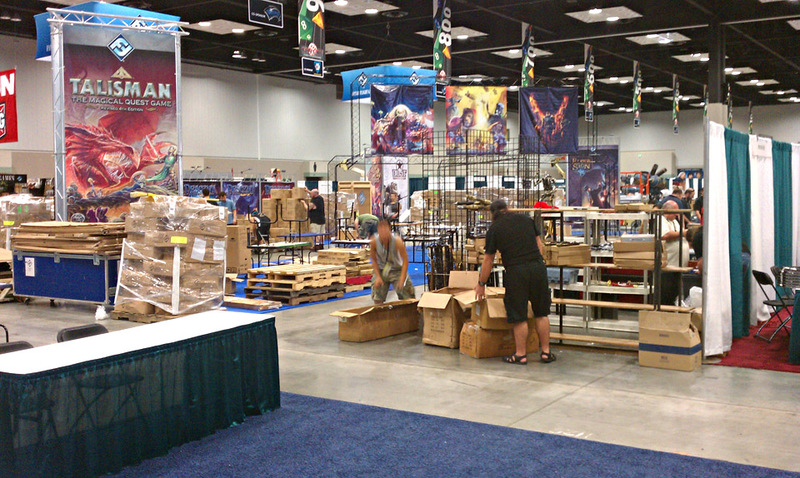 Ever wonder what GenCon looks like before it’s officially GenCon? It’s an exciting chaotic mix of pallets, cardbooard and giblets. Gandalf approves! More hurried unpacking before the big show! 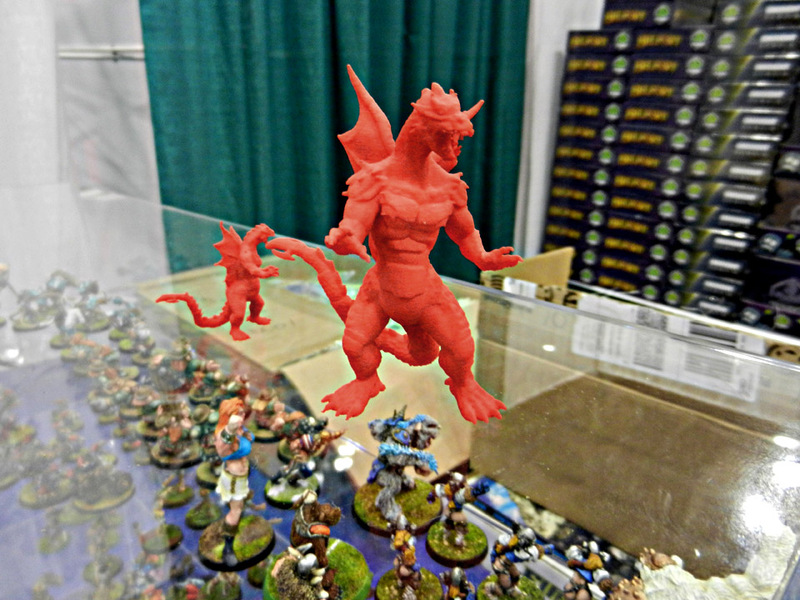 Preview of one of the giant kaiju minis designed by Impact Miniatures for Kaiju City. 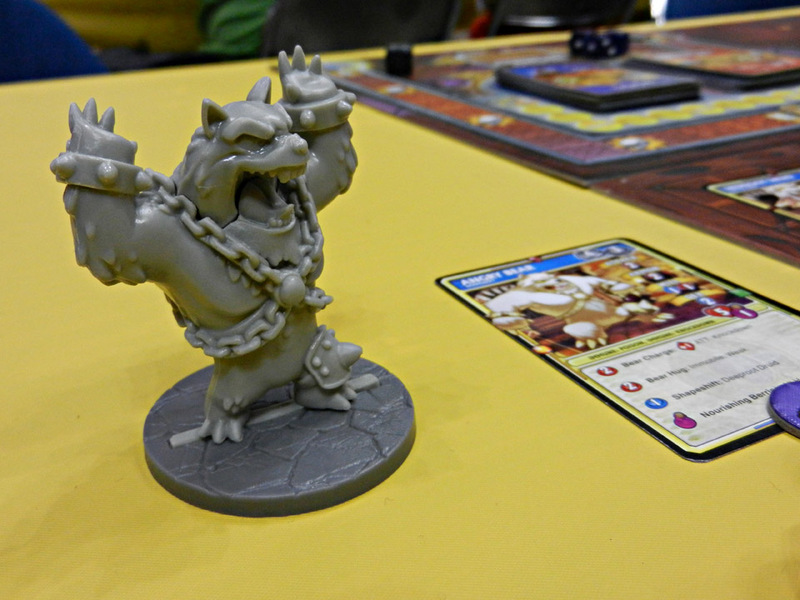 Oh yes, Kaiju City will be back – you can’t keep a good monster down! Proof that geeks actually do go outside from time to time. Indianapolis is a really cool city. 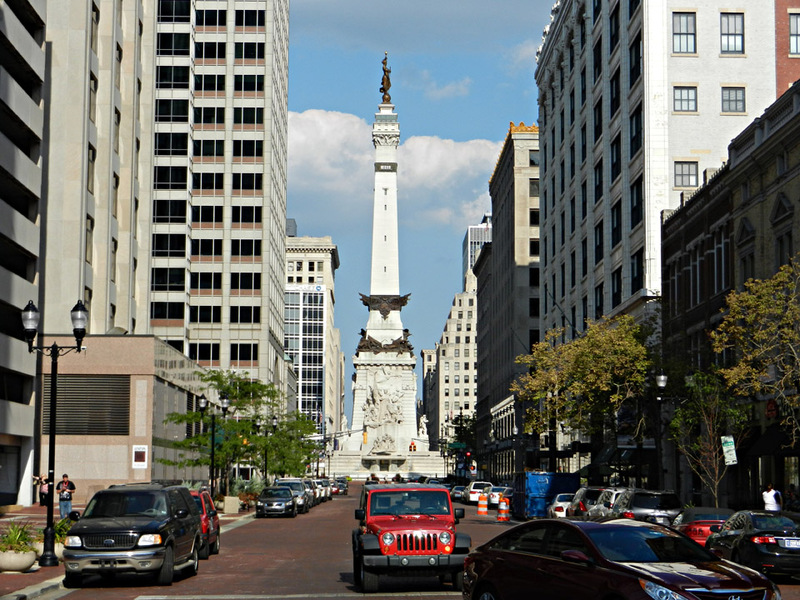 Did you know that Indy is second only to Washington, D.C. in number of statues and monuments in the US? It’s true. 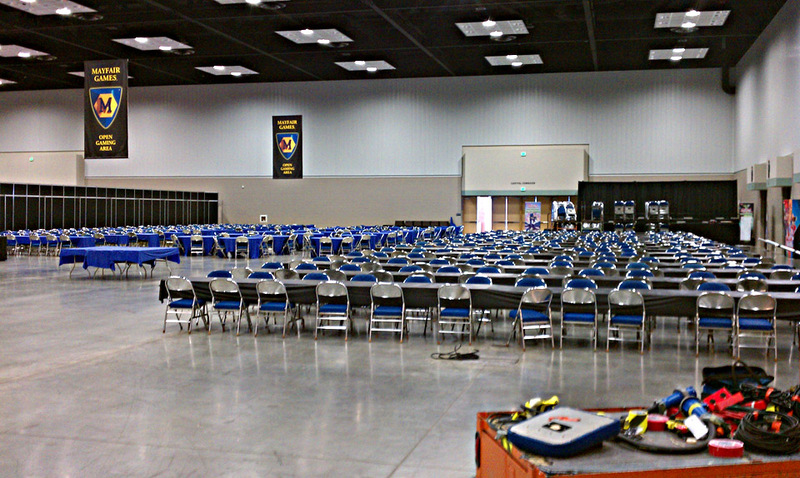 If you want to put the size of GenCon into perspective, this is Mayfair’s open gaming area. It’s bigger than most conventions’ exhibitor’s space! 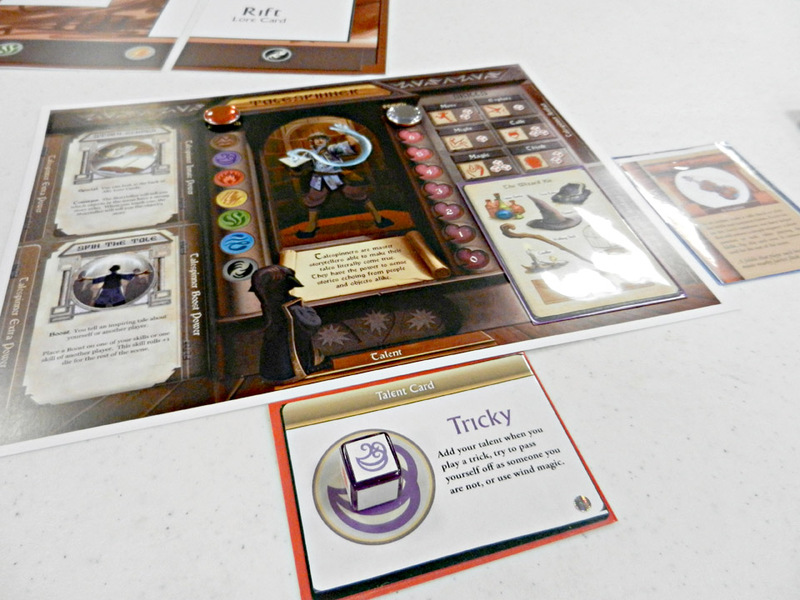 Playing Escapade Games’ Story Realms prototype. This game is awesome fun – we all built a ham-a-pult to save the day! Now that’s my idea of a storytelling. 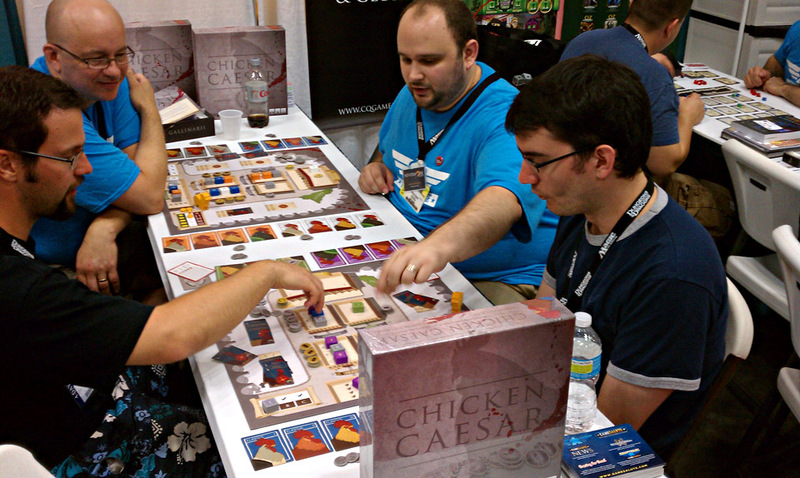 John Sizemore and Bryan Fischer of Nevermore Games demo Chicken Caesar. The production copy looks fantastic! Now that’s one beautiful coin. 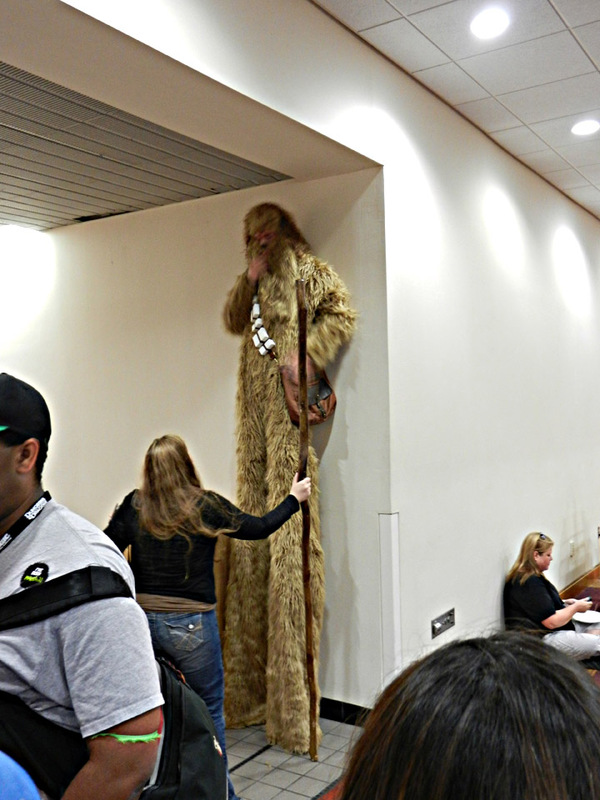 10-foot-tall Wookie. Why? 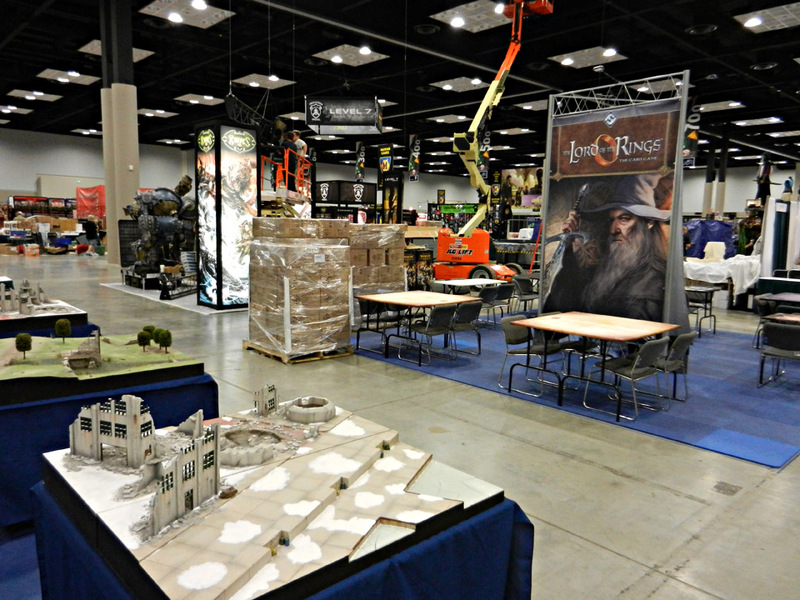 Because it’s GenCon! Dan Patriss of The Geek Allstars explains the finer points of good blending in VivaJava. 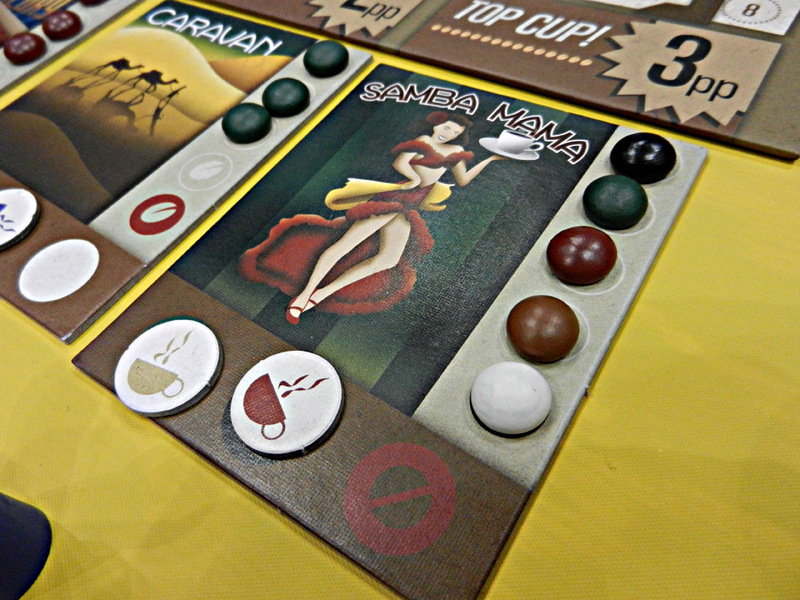 We played a lot of VivaJava at GenCon. A LOT. Event Hall E was always jam-packed full of awesome demos. 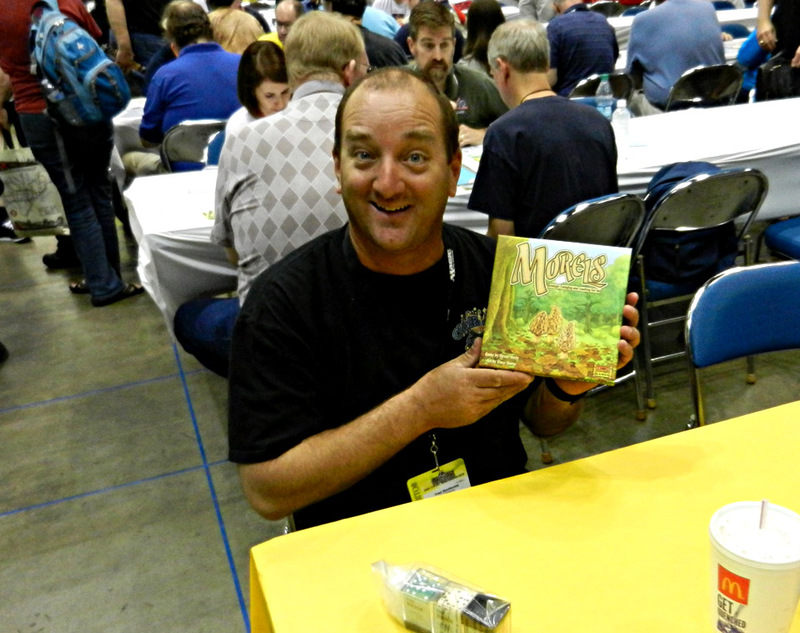 Fred MacKenzie of Clever Mojo Games is so very stoked about foraging for cardboard mushrooms. 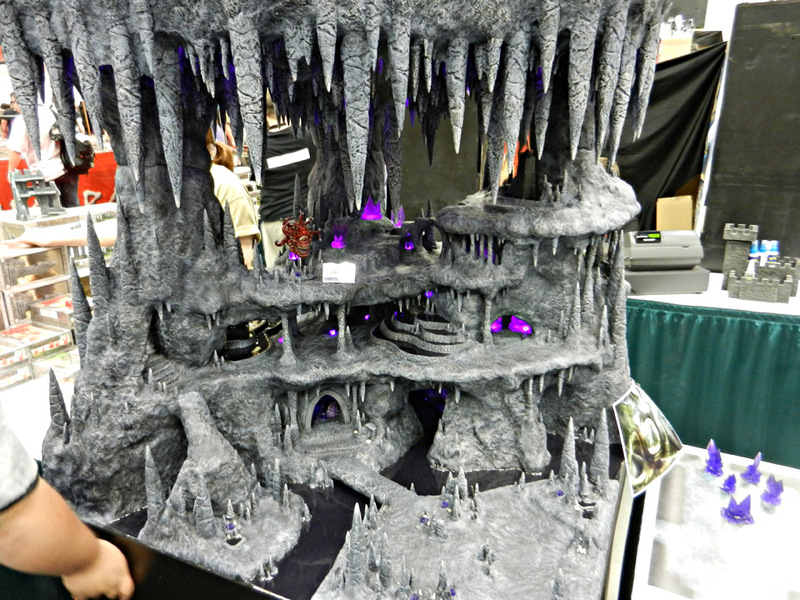 If you’re wondering if the production of Soda Pop’s Super Dungeon Explore is over the top, the answer is – yes. A rainbow Samba Mama. Now that is one beautiful blend. Designer Jason Kotarski gets ready to haul some cubes in The Great Heartland Hauling Co! 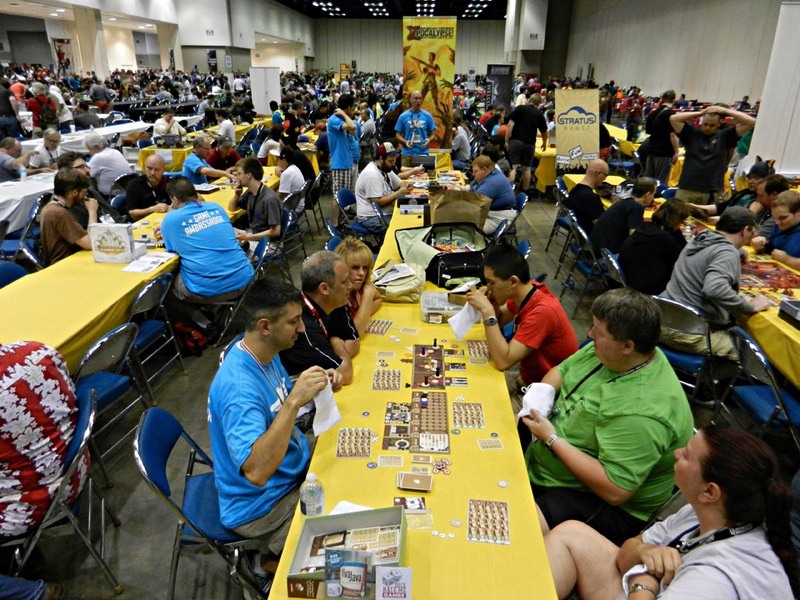 Jason played a ton of games of Heartland at GenCon and everyone walked away with smiles – especially Jason. You know what else brings a smile to Jason’s face? Brownie sundaes. 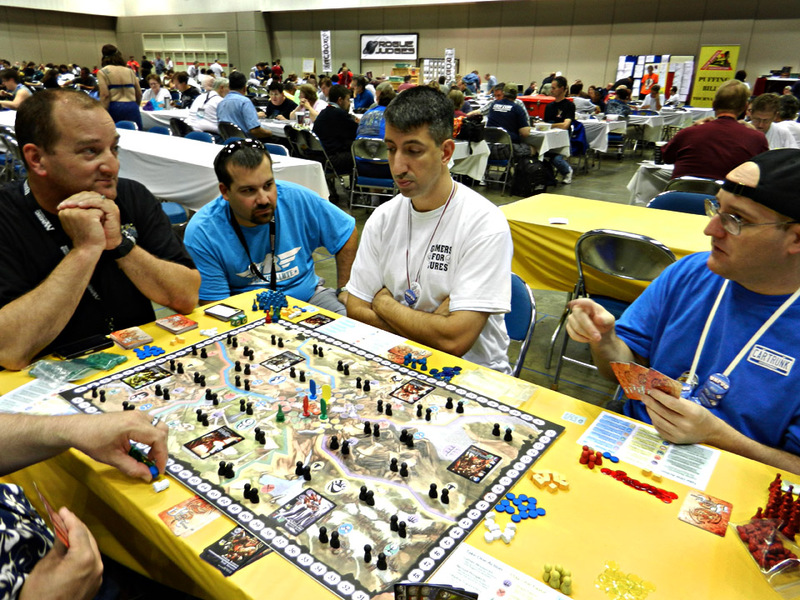 Fred MacKenzie and Philip Dubarry play Philip’s upcoming game, Courtier. One of my big regrets is that I did not get to play this game! 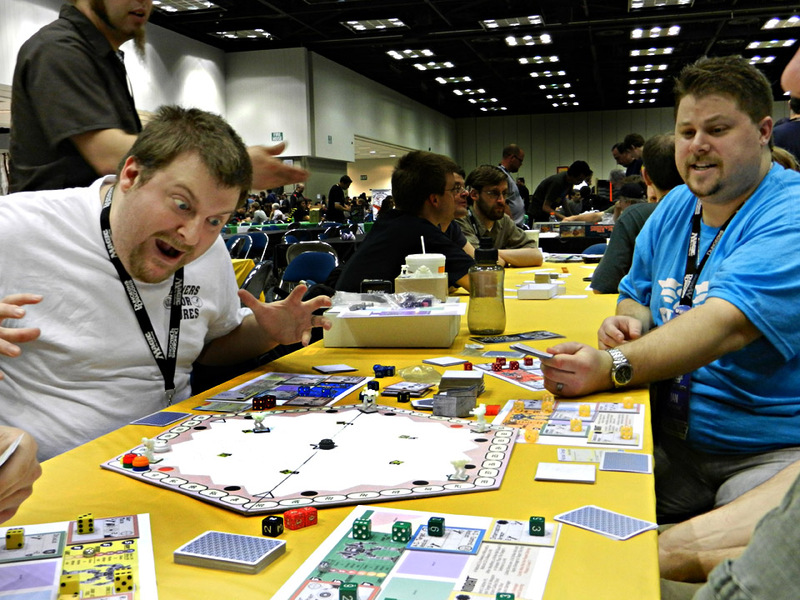 Patrick Nickell of Crash Games tries to demonstrate his “I’m on TV” face. That guy gets more media attention than a presidential candidate. Fred MacKenzie and Brian Frahm join me for a little Smash Up action. 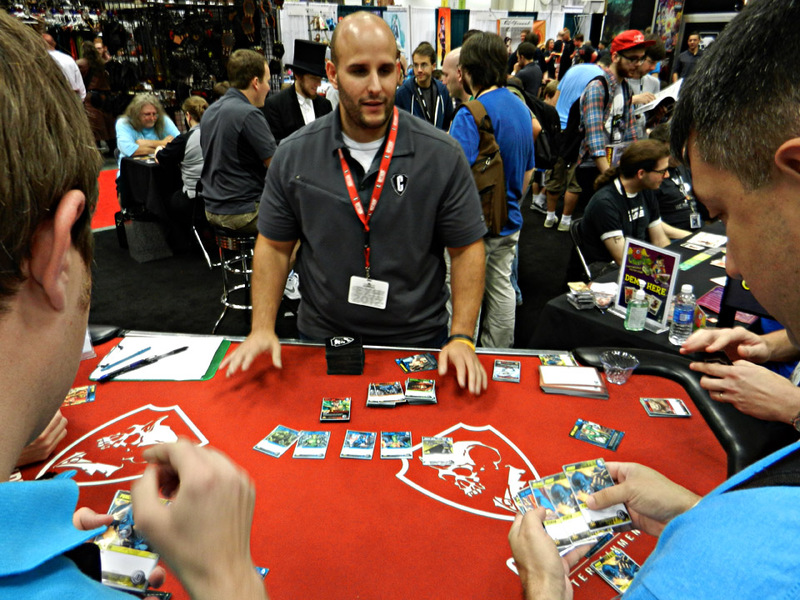 Lots of attendees estimated that Smash Up was the most-played game of the con. 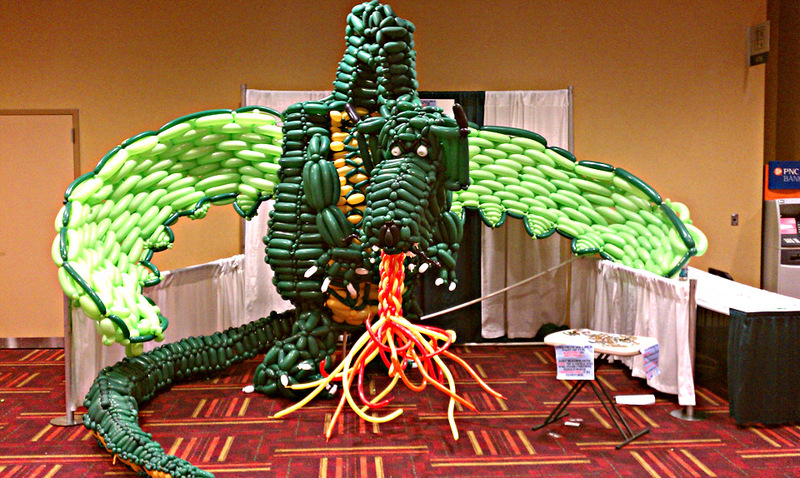 Balloon Dragon! Why? 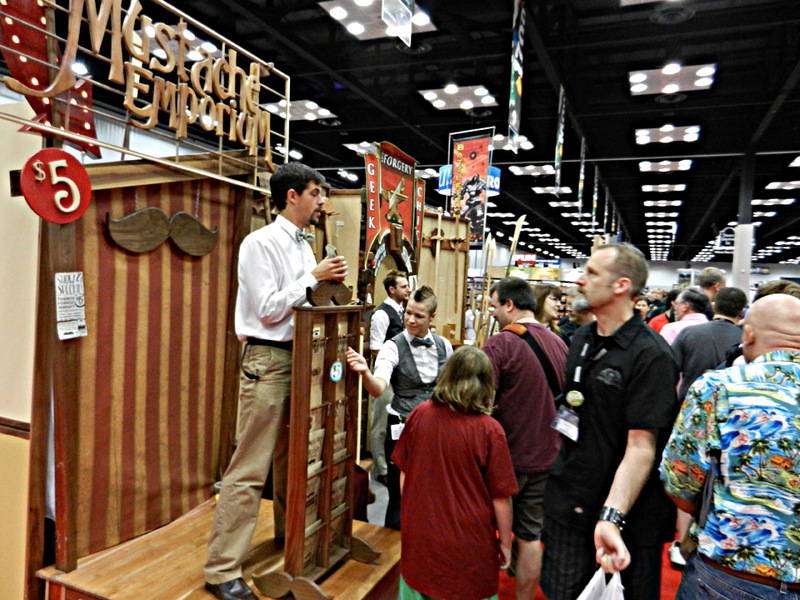 Because it’s GenCon! 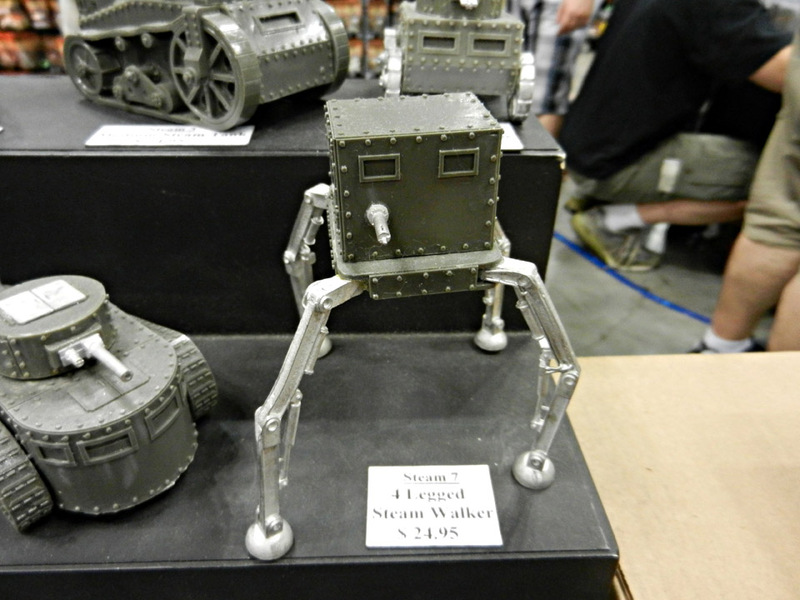 For me, this was one of the coolest minis at the con. I don’t know what I’d do with it, but I totally want it. 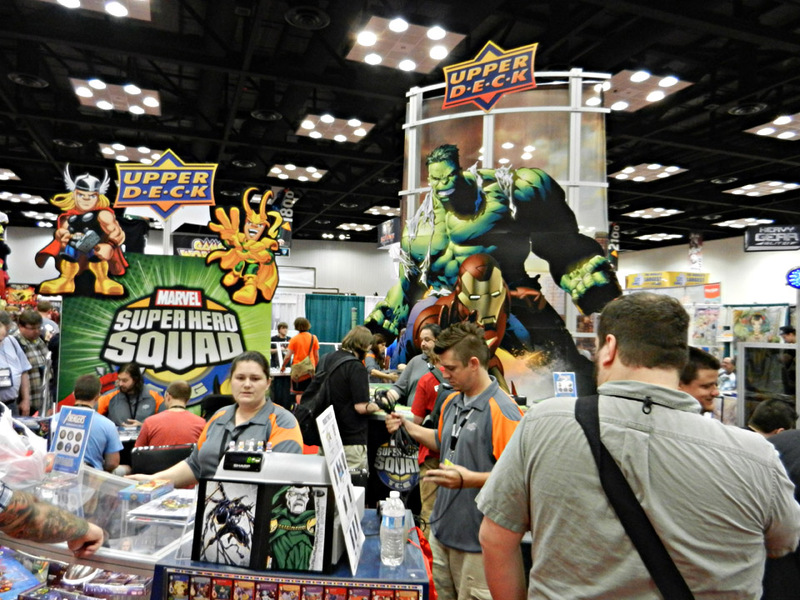 Upper Deck’s Marvel central. 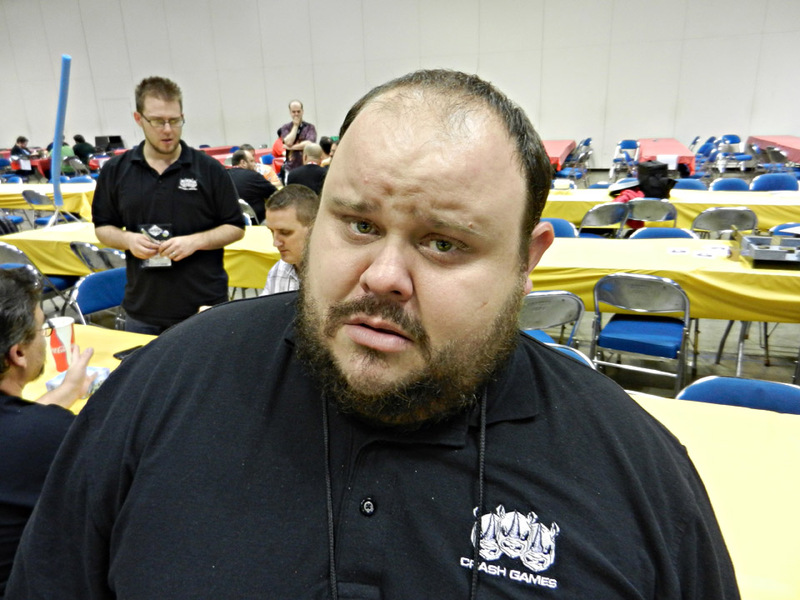 I wanted to check out the Marvel deckbuilder but it was invitational only. Mine must have gotten lost in the mail. 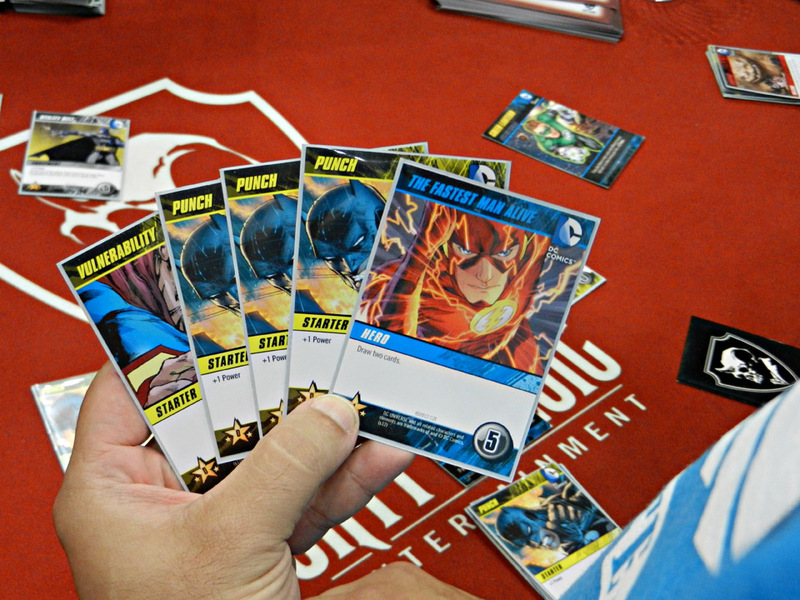 So instead of checking out Marvel’s deckbuilder, I went over to Cryptozoic and checked out the DC deckbuilder, instead. Take that! Speaking of that that, my buddy Dan put the hammer down and cleaned house with Martian Manhunter. Any game that has Flash in it is a game in which I’m interested. More of the glorious spectacle. I have no idea how to play Hot Rod Creeps, but I pretty much know I want it. Level 7: Escape looked creepy. From most that tried the demo that I talked to, there was a general big thumbs up for this title from Privateer Press. I don’t have any idea what’s about to be played here, but it sure looks awesome. You can’t see it in this pic, but all the little purply energon crystals are glowing. 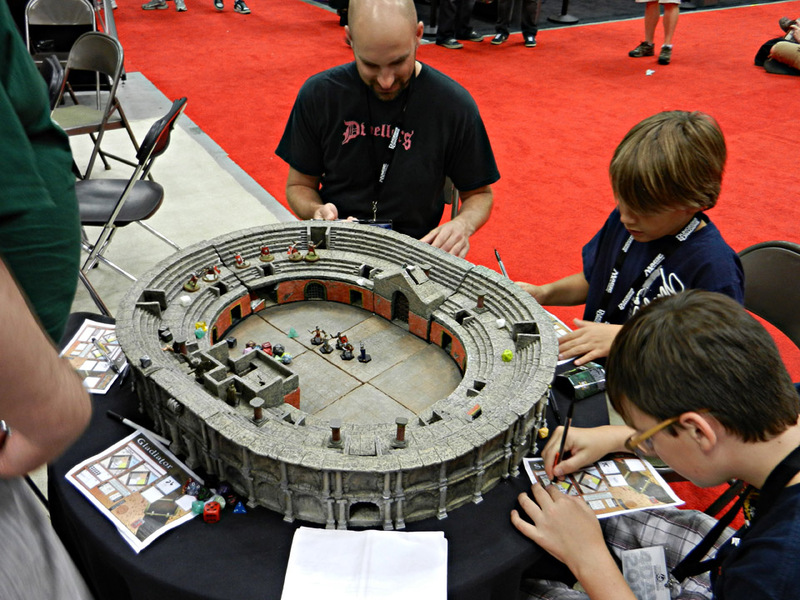 Yeah, that would make for one helluva D&D game night. Testing out the latest build of Fred MacKenzie’s Princes of the Dragon Throne with Dan Patriss and John Moller of Cartrunk Entertainment. It was a squeaker, but Dan finally edged me out by two points. 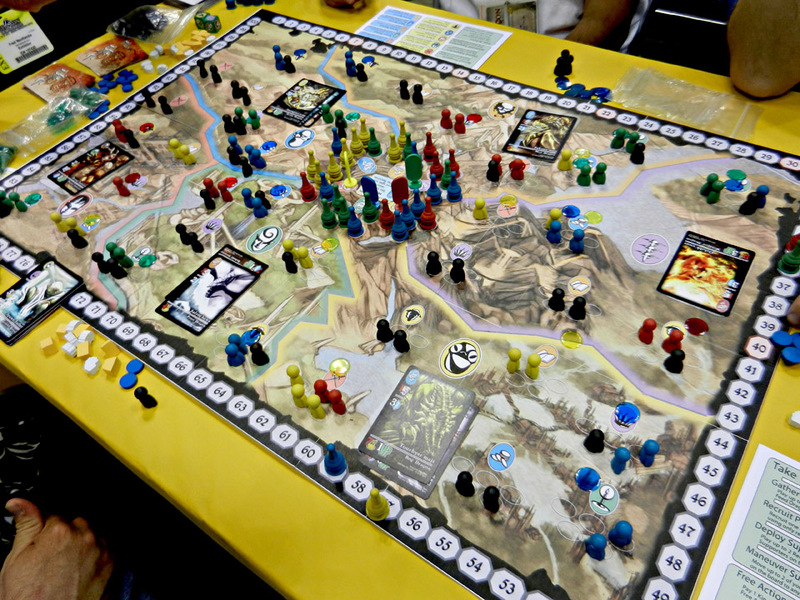 The game has come a looong way since I played it at Origins 2011, and it’s working like a well-oiled machine now. 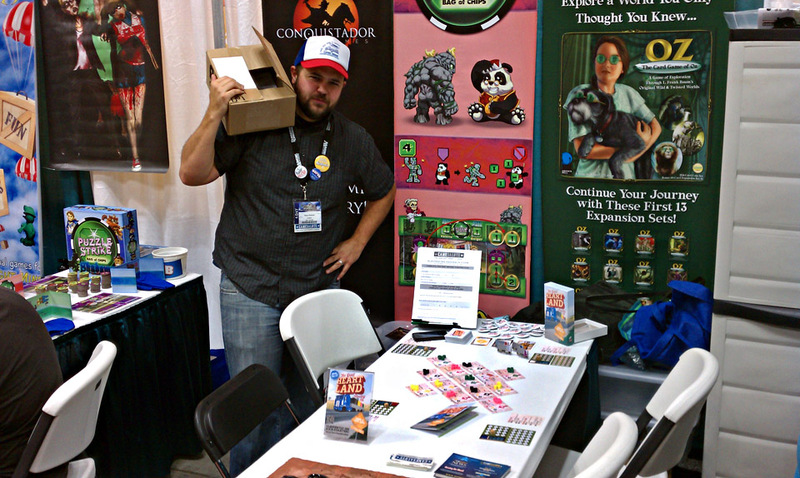 Adam O’Brien gets into character while playing Rick Collins’ ScrapBots prototype. Adam’s consensus was that despite it being not at all the type of game he likes to play, Scrapbots seems solid and has a lot going for it. Look for more info. 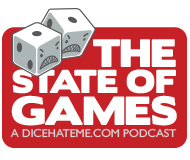 on this upcoming title from Clever Mojo Games soon on Dice Hate Me! 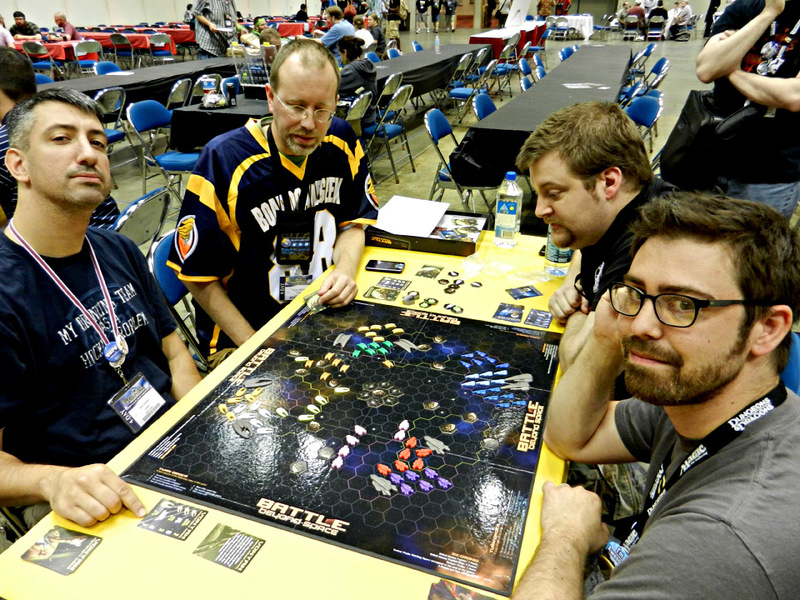 Joel Eddy (right) sits down with Fleet designer Matt Riddle to try out some Seasons. 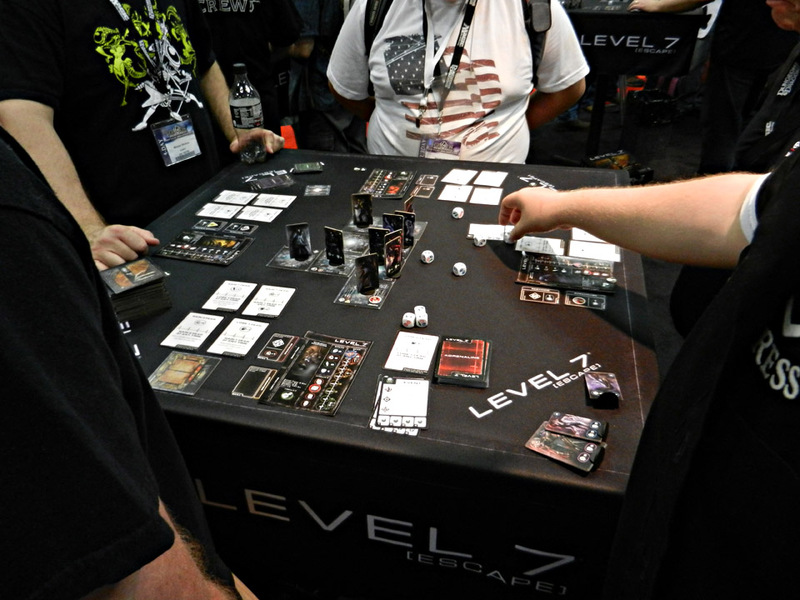 This was likely the second-most played game of the con and the general consensus is that it is awesome. 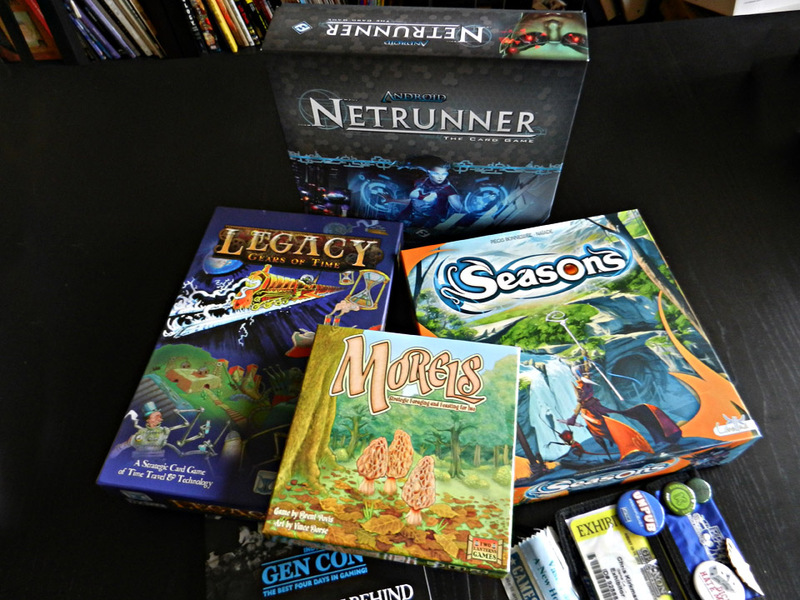 I’ll have more on Seasons, including a review, as soon as I get it to the table with Monkey238! 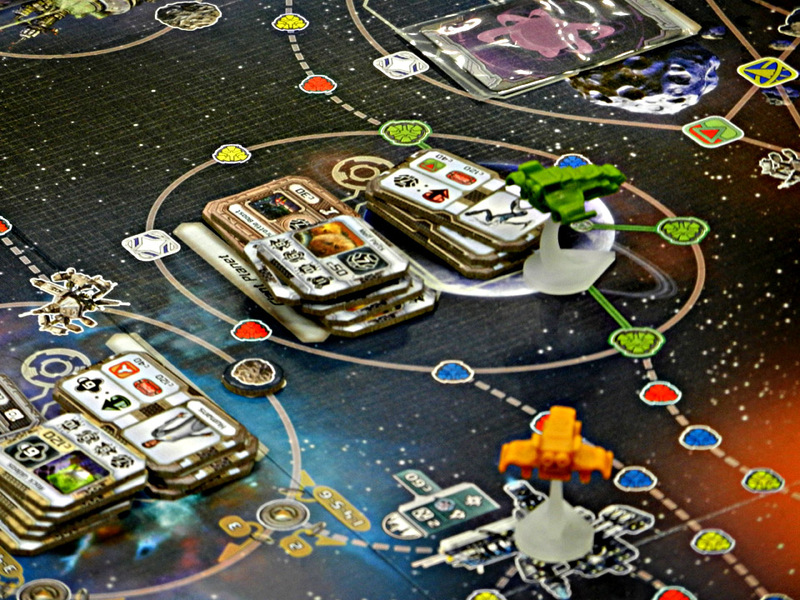 And speaking of Fleet, I got to sit down and play the game with the final production copy and the quality is outstanding. Also, still one of the best games I’ve played, period. 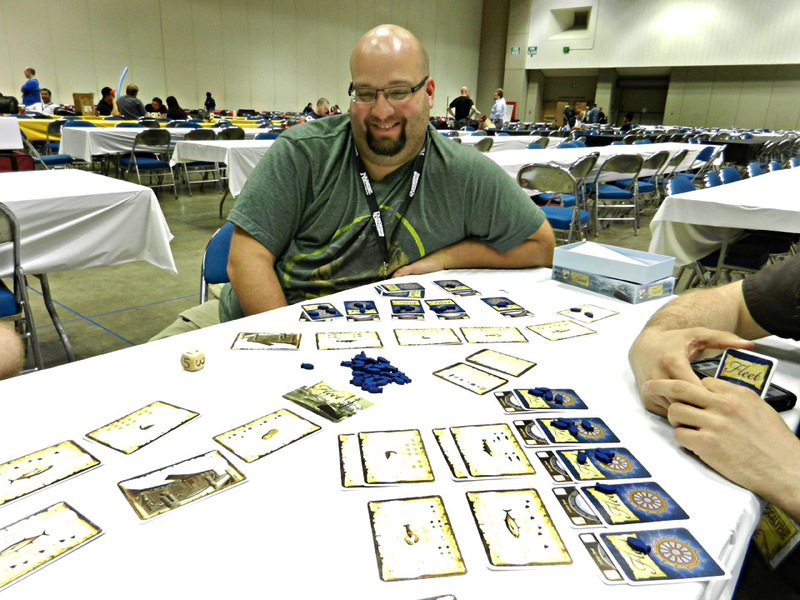 Here’s Fleet co-designer Matt Riddle laughing maniacally after he crushed our souls. Yep, I want that. You want that. You just kinda want to roll around on top of that, don’t you? Mustache Emporium! 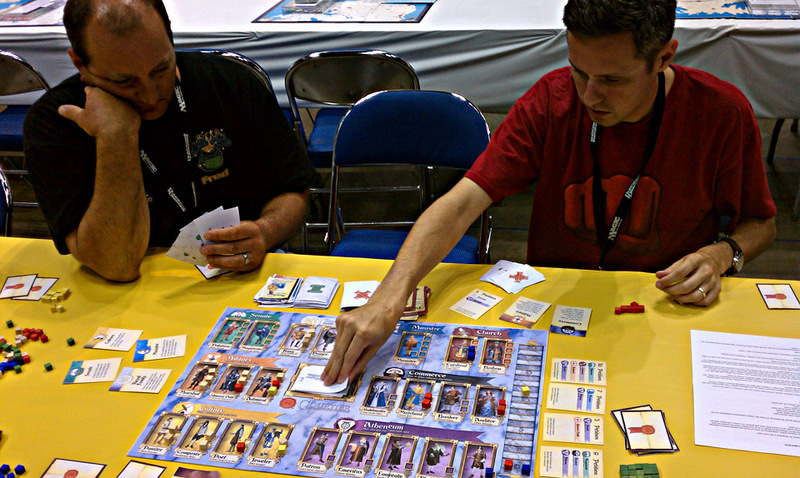 Almost guaranteed to let you go first in The Great Heartland Hauling Co.
Farmageddon designer Grant Rodiek and Sentinels of the Multiverse creator Christopher Badell had a super time at GenCon. 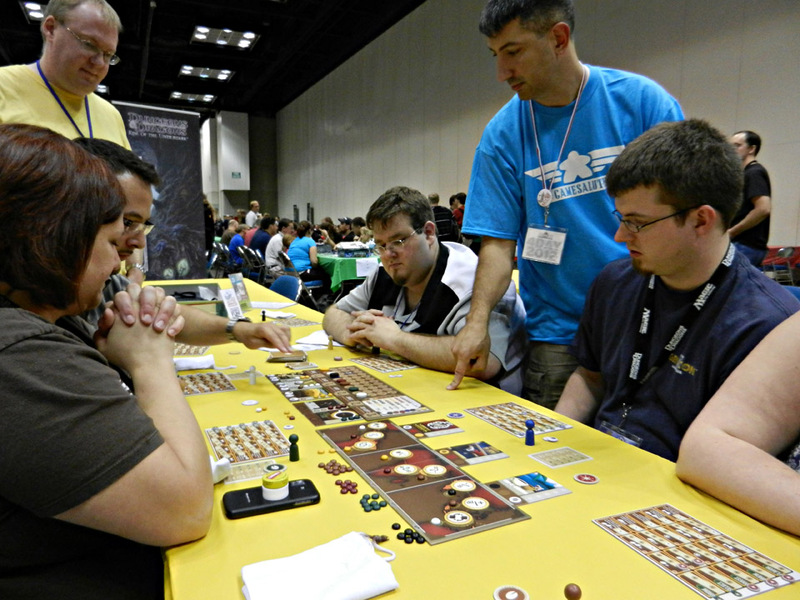 5th Street Games founder Phil Kilcrease shows some eager farmers how to avoid Foul Manure in Farmageddon. 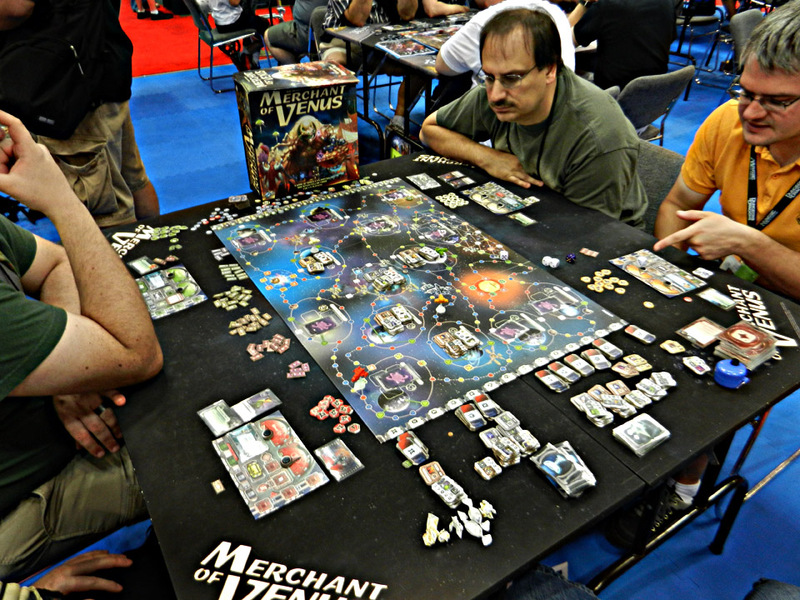 Merchants of Venus! Yes, there’s a lot of stuff in that box. It’s Fantasy Flight, what’d you expect? 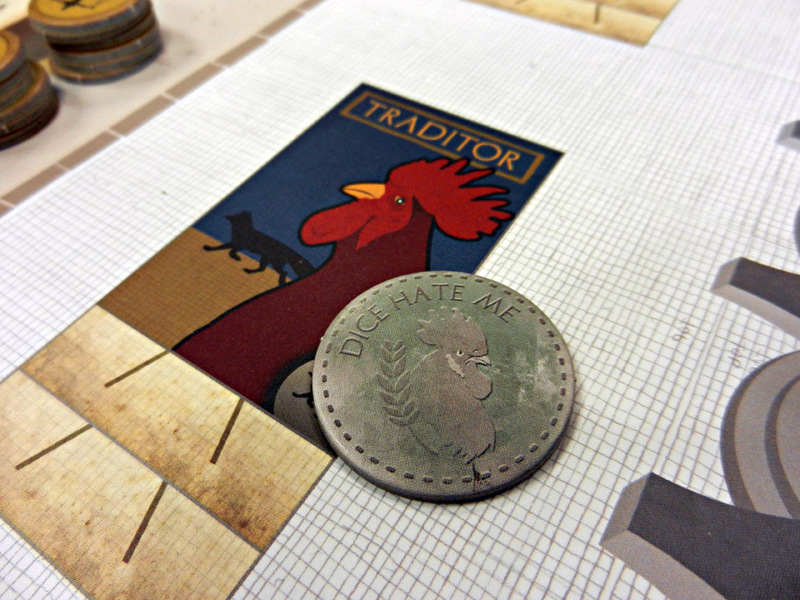 Close-up of some of the giblets in Merchants of Venus. 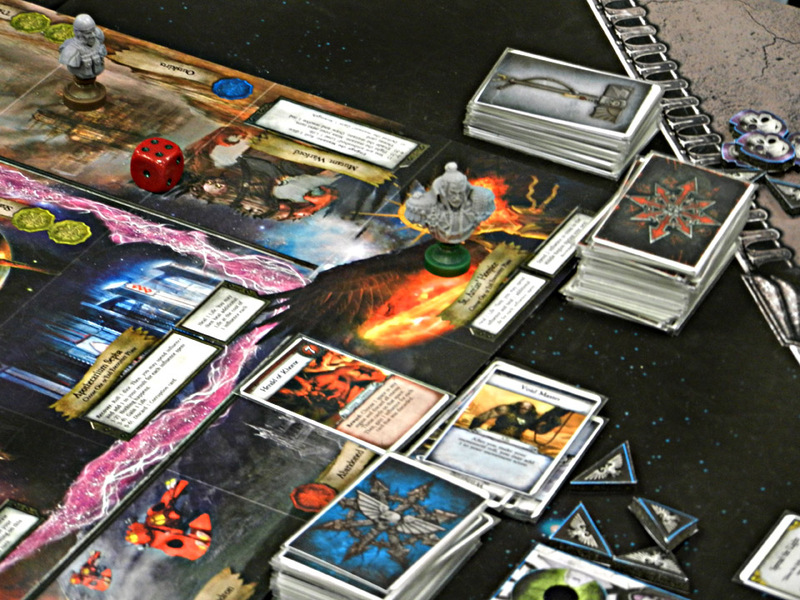 Preview of Relic – the Warhammer 40K retheme and reimagining of Talisman. You want it, I want it – we all want it. It’s pretty. Close-up of a couple of the character sculpts for Relic. 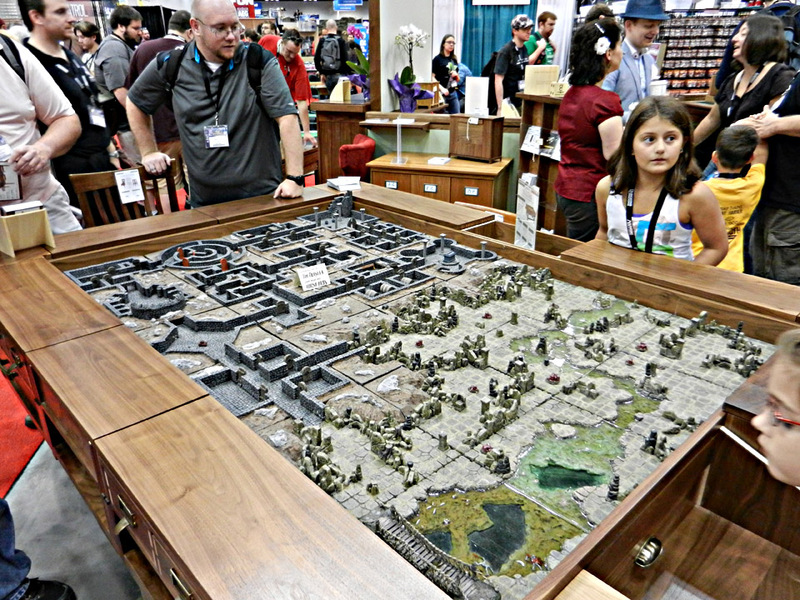 Fantasy Flight had some great table set-ups. This one was for Infiltration, and it was always packed with gamers. 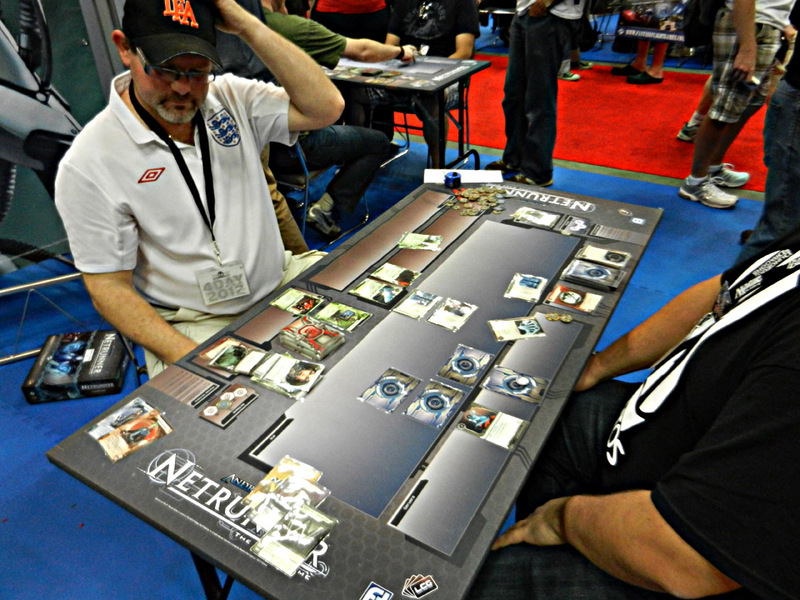 Netrunner! 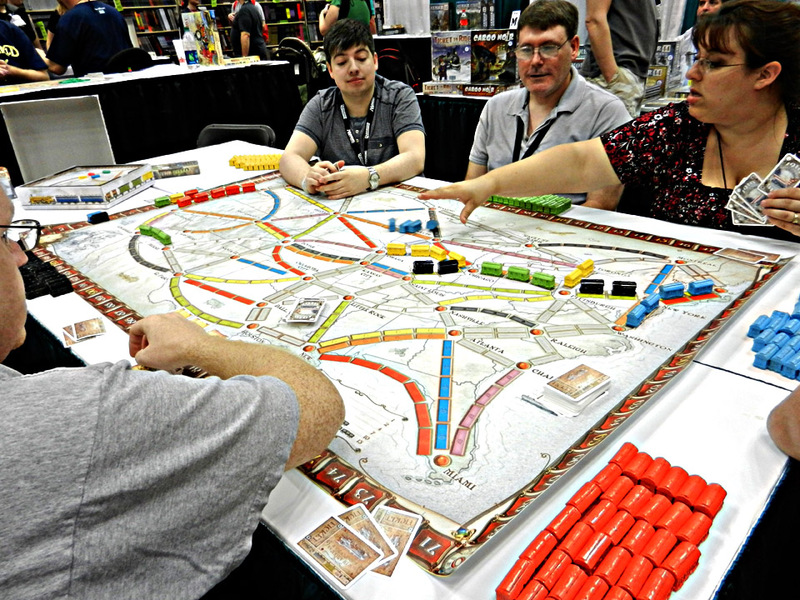 One of the hottest games of the con. I managed to snag a copy, so look for more on it in the next few weeks on Dice Hate Me! Thomas Denagh explains Android – in less than an hour and without a rulebook. Impressive. My somewhat-modest haul from GenCon 2012. Look for previews and reviews of these in the next couple of weeks on Dice Hate Me! 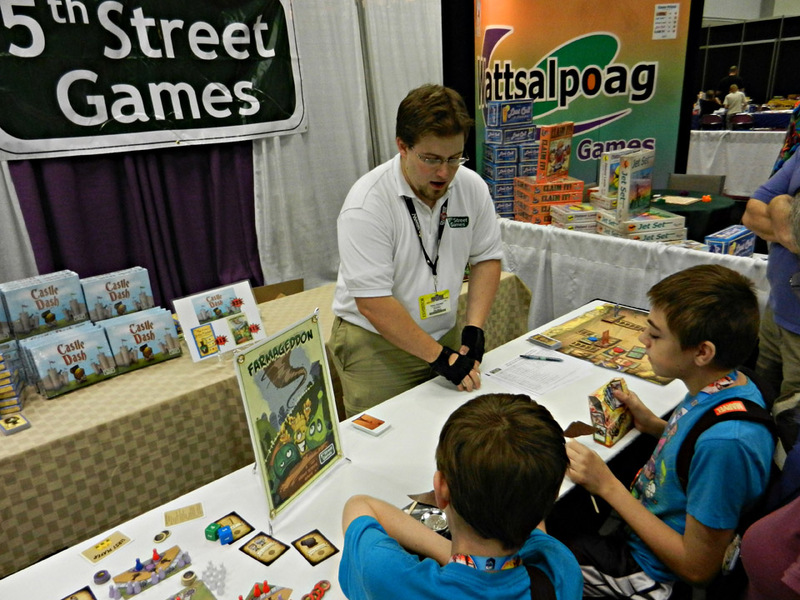 See you all at GenCon 2013! Awesome write up and pics! I think that Level 7 is from Privateer Press and not Cryptozoic to make a tiny correction. Enjoyed meeting you in person finally. Just wish we’d gotten to play a game together. 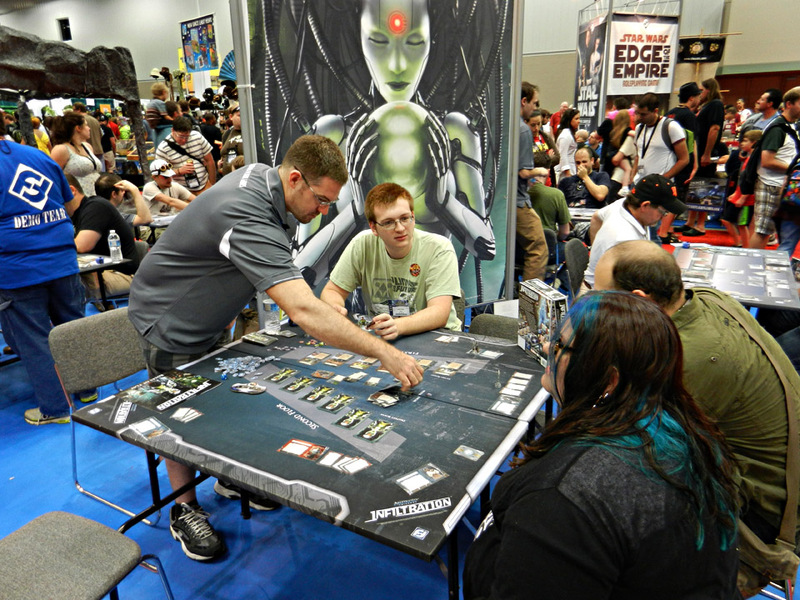 You snagged a copy of NetRunner! I heard it sold out in 45m. So jealous. That was the only game I wanted to specifically go home with. Thanks, AJ! It was great meeting you face to face, and I wish we had gotten a chance to game, as well. Next time! And thanks for the correction – I must have had Cryptozoic on the brain. Fixed! Adam – I was lucky that I had an exhibitor’s pass. I snagged one on the first day because I knew they’d be flying out the door! Hurry up with that review of Seasons already! I want to know more about it. Also, nice to see Morels included in your haul. You and monkey238 should enjoy that one. It’s a fun 2-player with a nice theme. Brent did a nice job with that first title from his fledgling company. 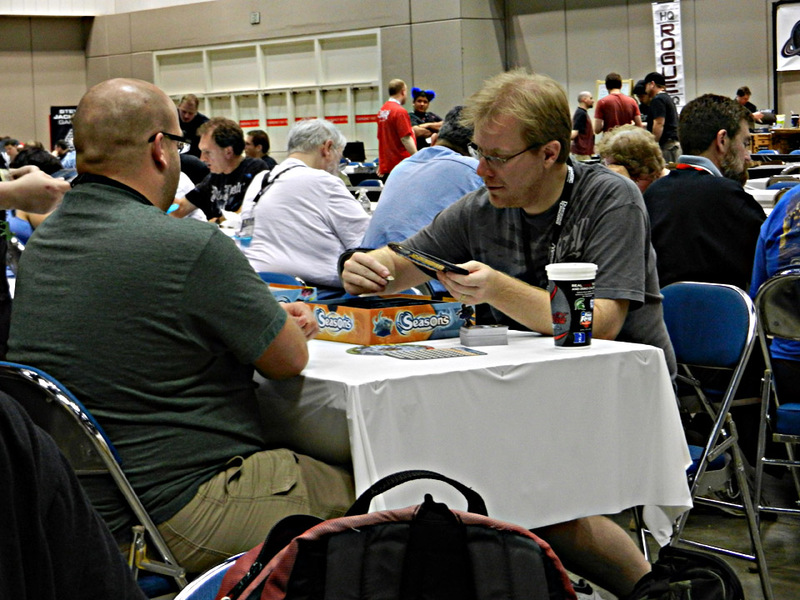 Man… still decompressing from Gen Con. What a great time. I am glad I got to play Fleet with Chris, and seasons is legit fun with 2. Not sure how all the card craziness scales to 3-4, but for 2 it was fun. Alos, on of knew how to play and had logged a few games on BGA, one of us was a noob… and won. hizzy. Can’t believe I missed the spectacl3 this year! 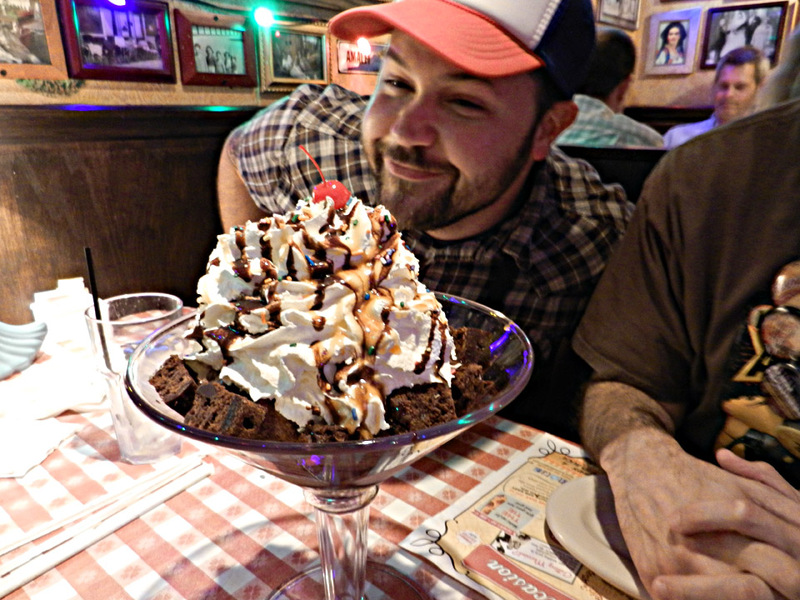 All the gaming goodness and brownie sundaes on top. The fact that Fantasy Flight actually had two games I want to play makes it a banner year for them in my eyes! 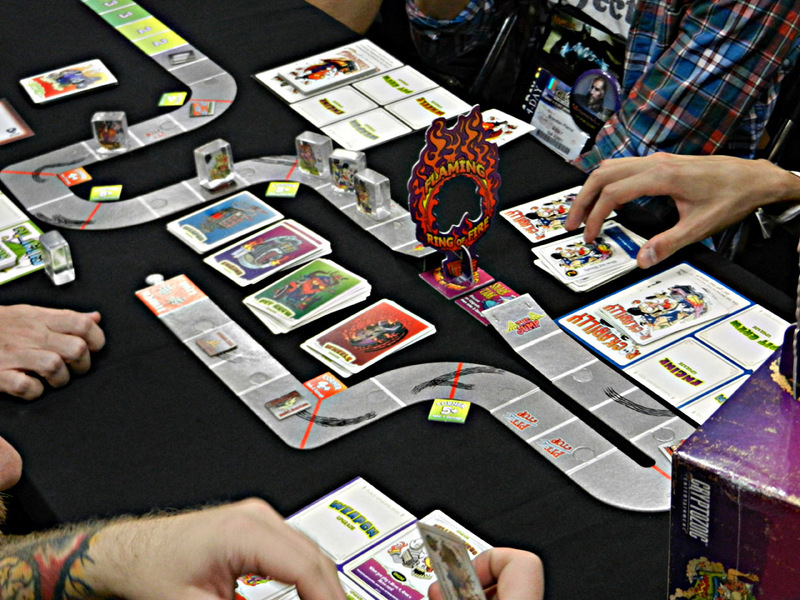 And if only that Hot Rod game wasn’t by Cryptozoic, I’d really want to take it for a deathly spin. I’m Patrick Nickell from Crash Games and I approve this message. Lee – I’ll do my best! I’m trying to convince Monkey to play Seasons with me tonight, so I’ll have a first impression up soon! And yeah, I was really happy to pick up Morels and support Brent. I talked to them about their possible move to the Durham area and it would be cool to have them here. 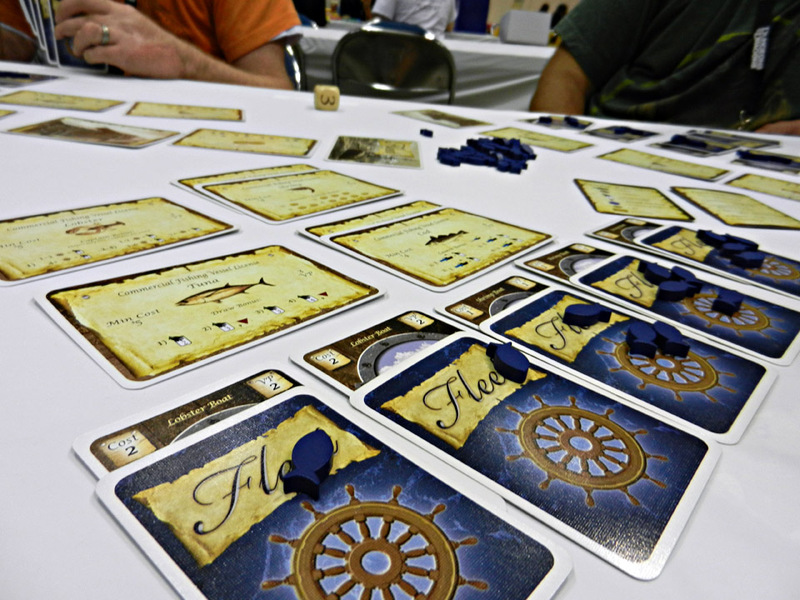 Matt – It was awesome playing Fleet with you, even though you crushed. But it was still tight! If I had possibly gotten that Shrimp and Rick was able to keep the Crab out of your fleet, we may have stood a chance. Really looking forward to Seasons – hopefully Monkey will play with me tonight so we can see how fun it is! 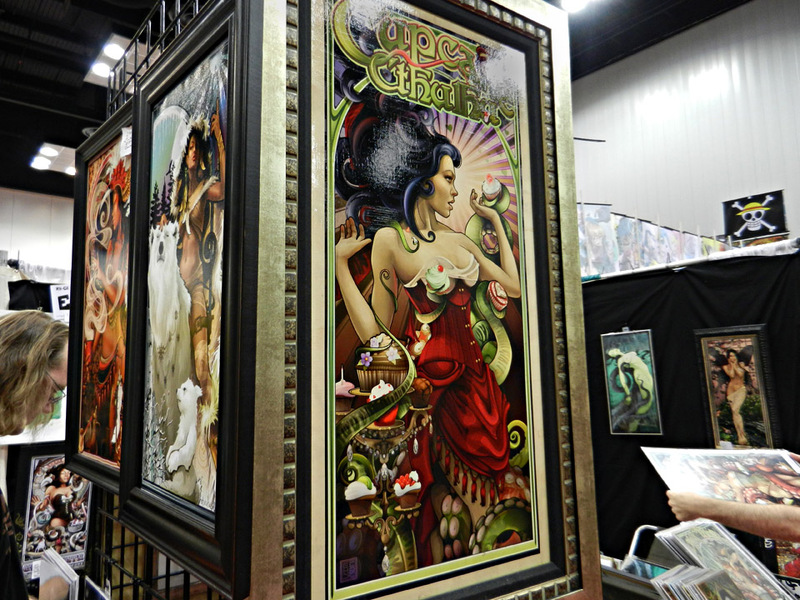 TC – We certainly missed you at the big show! Everyone was asking if you’d be there. We need to make sure the full posse is there and in effect next year. And yeah – Fantasy Flight unleashed this year. It was pretty incredible. Don’t know much about Hot Rod Creeps, but I know I wanted to fondle it. Patrick – I think I’m going to put down a $100 deposit with you every con so that just in case you get on tv again you’ll mention Dice Hate Me. Great photos, Chris. You caught a lot of the experience that I missed! It was a great time for sure. I mean, I missed a lot of the stuff you saw even though I saw a lot…umm…yeah, nevermind….English is not my friend tonight. Can ten minutes of drooling over photographs make up for missing out on GenCon? Well, no, not entirely … but it helps. Thanks for letting me be there vicariously through your camera! Glad to see you picked up Legacy. Played it on Tuesday with Larry and the Tasty Minstrel guys. I really enjoyed it and look forward to your take on it. Great pics! Sorry I couldn’t stick around longer! Jason – No worries, I understood what you were saying. 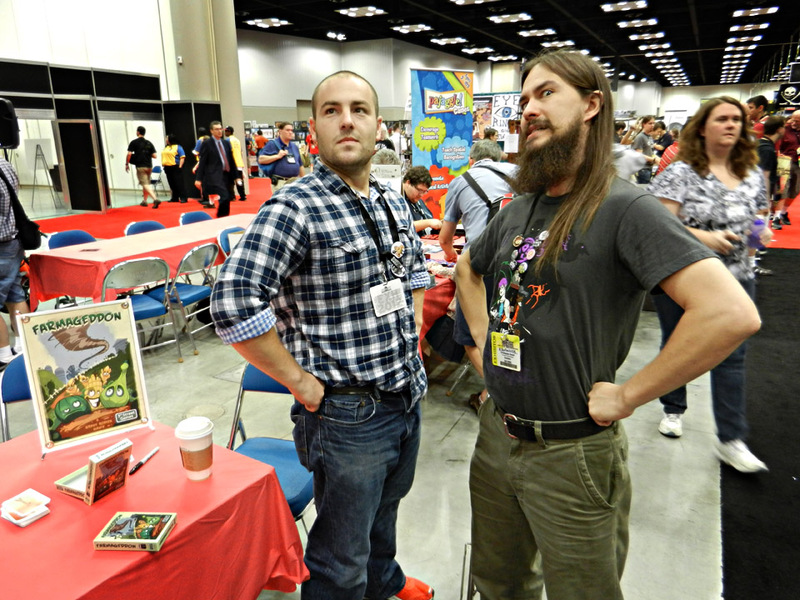 Great to hang with you at GenCon, man! Paul – Thanks, wish you could have been there! I’m glad I can provide at least a small glimpse of the insanity. If only I had had more time. Eric – Yeah, I picked it up after seeing your tweet when you played with Larry, Michael and Seth. I talked for a good long while with Ben Harkin and he’s a good guy. I’m really looking forward to playing! Philip – Yeah, one of these days you’re going to have to stick around for the cons a bit longer – there’s too much to do! I’m really looking forward to Courtier. Chris – Yeah, it’s a real shame we didn’t get to try Snake Oil; I was amped about it, but we were crashing hard on Saturday night. It was good we didn’t stay since most of us were almost falling asleep at the wheel the next day! As for Morels, I didn’t get in on the sticks and pan, but Brent is sending me a set once they get back from GenCon. 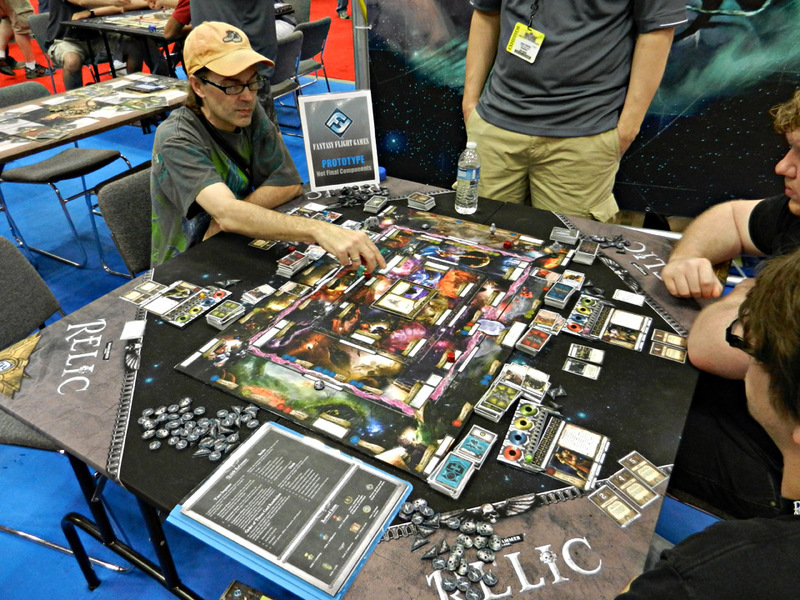 I wanted to check out Libertalia, but my friend Adam described it as a really expensive game of half of For Sale, so I held off on buying a copy. Tom Vasel told me on Tuesday that he really liked it, but I’m going to stand back until I find someone who has one I can demo. By the way, Hanabi looked pretty sweet. It was great to see you! We need to game together! You’re really going to like Morels—I snagged that one at Origins. Chris, I have Libertalia and would be happy to teach it to you. It’s better with more players and less Adam, him being a sourpuss stick-in-the-mud. As for Battle Beyond Space, repeat that comment I just made about Adam; I think he was looking for some other kind of game and was surprised by how fast and self-destructive BBS is. Plus I used my superpower to rob him of a ton of points before wrecking his fleet on the subsequent turn with my reborn ships. Sour grapes, I tells ya! Nicholas – Yeah, I can’t wait to try it out with Cherilyn. I’m really looking forward to it! Eric – Ok, you twisted my arm. I really would like to try Libertalia; it seems to have a lot of mechanics that I enjoy. I’m glad you bring up Battle Beyond Space, as I’ve been thinking a lot about that game and would like to give it a shot, as well. I’ll just make sure that I don’t play it with Adam. Geez, so many pictures of me I thought this was a pictorial review of FredCon! But seriously, I had a blast hanging with you. It would have been even better but for those dang hidden ninjas! Fred – Hah! Seriously, you was robbed in Smash Up. 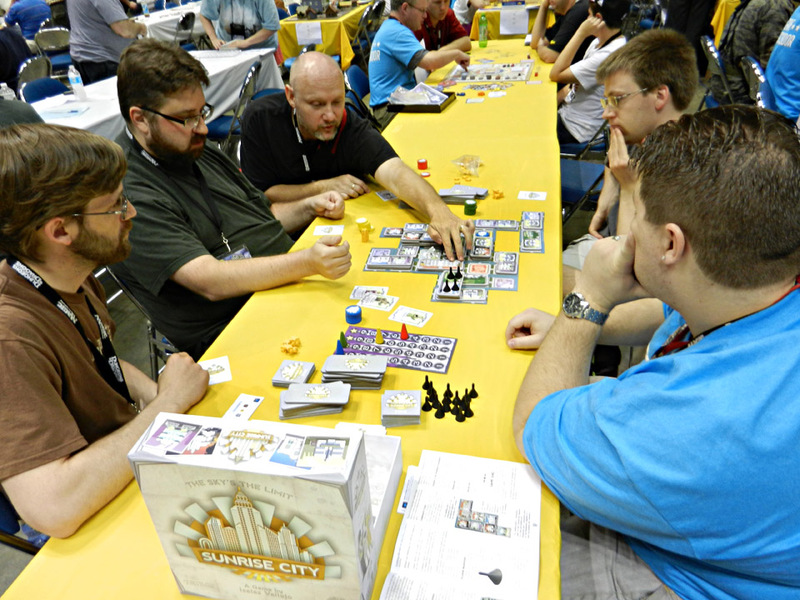 I’m really glad we got a chance to hang and game a lot at GenCon!